It's been a while since I've posted a completely new bracelet; so let's have one full of beads I've not mentioned before to make up for it! "...the history, the influences from different cultures which were often told by artifacts archeologists had found. But I also love the animals who live here and who create a paradise for divers. All these sunny and happy memories and things I have seen in the surroundings are coming back in this collection. I hope you will love them and may bring vacation around your wrist or neck..."
For me, it does exactly that. I love the Med and this reminds me of many lovely holidays I've taken over the years. 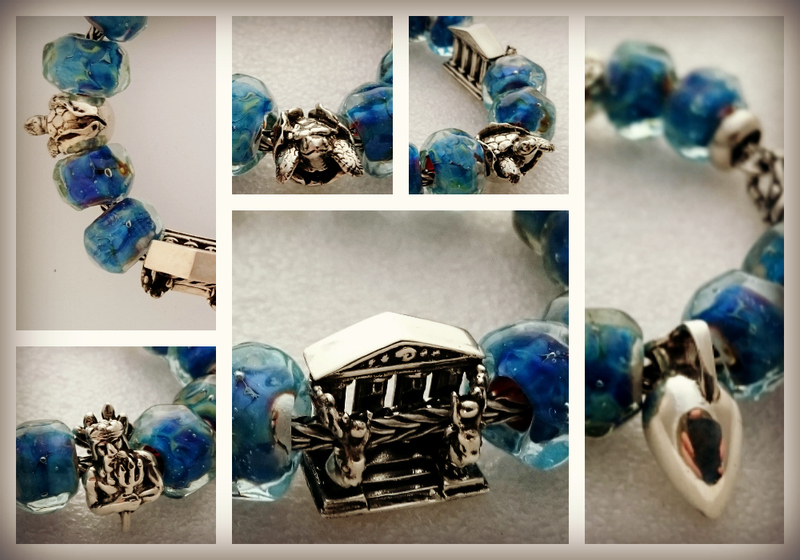 The silver beads are Turtle in Egg, Neptune, Atlantis and Amphora, the lock is by Trollbeads and I'm wearing these on a Trollbeads chain. The beads are beautifully detailed, I love how Atlantis has the chain threaded through and looks like two different beads depending on whether you see it from the front or the back, the turtle is delightful, I have quite a few turtle beads but this one is definitely my favourite. Neptune has a tail which fans up his back and the Amphora bead has a small hollow like a real Amphora, atlhough it's still a very weighty bead! I've even heard of some people filling it with something sentimental and having it "capped off" by a jeweller. The glass is by artist Gea Hines, I had to track her down after I'd seen some small hole beads she'd made that looked like sunlight on water. I asked if she would be able to make something similar as a big hole bead (so they would fit onto my bracelet chains), and once she confirmed that was possible; I ordered 10 of these to be made especially and I'm delighted with the results! I may at some point be tempted to core these with silver myself, but for now I'm leaving them naked as it's such a pretty look. I love the Mediterranean, what are some of your favourite places? Beautiful glass beads :) And the silver beads have a wonderful level of detail in them, I'm always impressed when I see them! Honestly, it's not exciting but my favourite places are our front porch and the provincial parks that we go camping. They are both just very calming and peaceful and make me feel like I'm exactly where I'm suppose to be. We haven't got a fraction as much camping done as we'd have liked to this year, I can't believe it's August already. We seme to have been busy every weekend but I'd be hard pushed to tell you what we've done! That is just absolutely gorgeous! What amazing, clever beads and the glass is lovely. I've never been to the Mediterranean but I love the Caribbean.